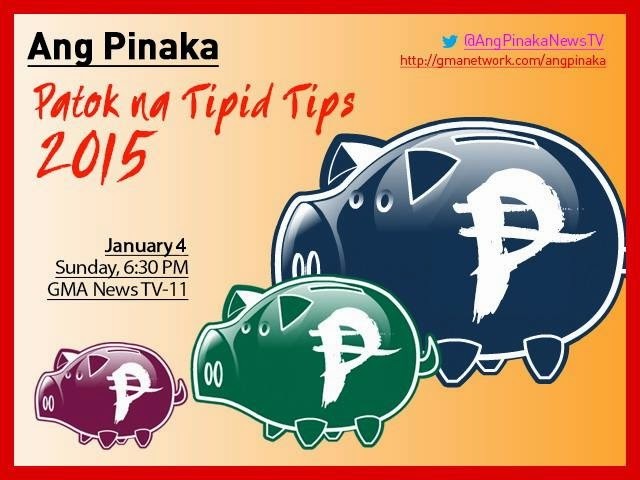 Yesterday at GMA News TV channel, the Ang Pinaka show featured the top 10 Patok na Tipid Tips for 2015. The tidbits of tips when it comes to saving will definitely benefit Filipinos this year. So to share the information, I’m reblogging the show’s top 10 list with additional points. 10. I will find a charitable work and learn to share. Filipinos are very charitable and there are countless bonafide organizations where you can share. Monetary donations are not the only means to share. You can also give items in kind as well as your time. 9. I will open an investment account. Ask your local bank for more information on bonds, stocks, and funds where you can invest money. You don’t need a lot to start. Even a minimal amount will do. Investments can grow bigger than bank savings especially if you don’t liquidate your assets for several years. 8. Going out or weekend getaways need not be in the malls. Malls can be considered as one of the easiest places to spend money because you dine and shop almost all the time. However, like one of the panel guests of the show had mentioned, any place can be a temptation to splurge if you don’t exercise self-control. Even staying at home can lead to spending due to online shopping sites. However, malls can indeed be where you are tempted to spend the most due to the abundance of commercial stores and shops where products are sold. An alternative to malls include public parks, zoo, and beaches. 7. Improve your financial literacy skills. One panel guest of the show believe that financial literacy is achieved when you know how to save and how much. You may also consult experts, attend seminars, or read books to learn financial literacy. A more affordable option to become financially literate is through free articles readily available for reading online. 6. I will follow my money. Following your money means to be able to account where you spend your funds, as per Ang Pinaka’s Twitter account. Does it ever happen when you are not sure where your money went and you have no idea what you spent it for? If yes, start having a list of your expenses. One panel guest suggested that we spend only what we are able to afford. After setting aside money for savings and a budget for expenses, what’s left is what you can spend. The problem starts when we start spending beyond our means and even borrow just to make purchases. 5. I will open another bank account. According to the panel guests, most Filipinos only have one bank account, which is their company payroll account and often debit everything once salary is credited. To start saving, it’s best to open a separate account. 4. I will buy only when I need and not because there is a sale. Many are guilty of purchasing products that are not really needed due to a supposed sale. Although you do save money in the process, you still spend for something you probably won’t need anyway. Hence, it’s better to buy only when you need something and not because of a sale. 3. I will separate shopping day with buying day. The show’s panelists described that buying is for what you need and shopping is for what you want. Most people often shop during grocery day which obviously leads to greater expenses. To prevent incorporating shopping with buying, go straight to the grocery and leave once you’re done. 2. I will follow savings equation and save 10% of my income. Some save even more at 20%. Others even include a contingency or emergency fund which can be used as needed in case there is a budget deficit. 1. I will stop impulse buying. Panelists invited by the show described impulse buying as purchasing something as soon as you see it. To avoid this, planned spending should be the alternative wherewith you carefully choose what to buy or plan ahead; making sure to already know exactly what you want before you even purchase so you’re not distracted by anything else that pleases you. In malls or anywhere else, don’t buy right away. Try the product first and compare the prices from different stores before you splurge. It also helps to buy not based on emotion where you shop when you’re sad, happy, bored, or what not as per the suggestion of panel from panelista Direk Jose Javier Reyes whose wise words concluded the show. 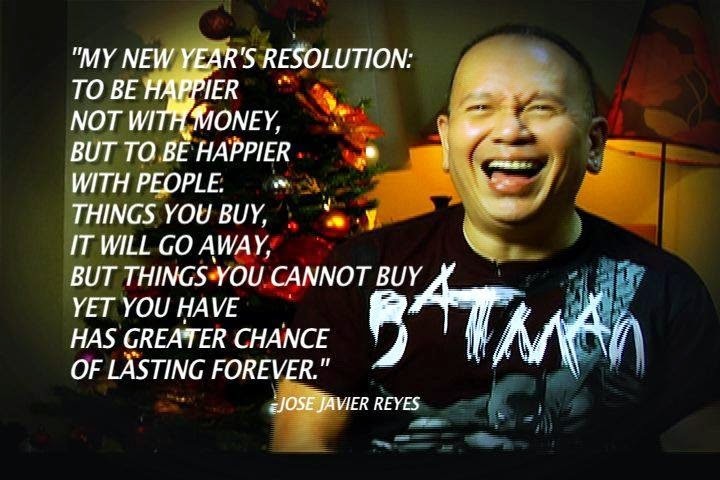 Have a tipid 2015 everyone!